Mike and I have been planning this day for months, well more me than him. I knew I wanted both families to be surprised. Mike and I decided to wait till we could tell everyone the gender to be the day we announced as well. I made a Facebook group for a "surprise" birthday lunch for Mike and invited our families to TGI Fridays in Sandy. I had to pick a place that was only in Sandy and near the South Town. Not to mention it is where we first met. I let them all think he knew nothing about it and of course he was scheming right along side me. I made Peyton a Big Sister shirt to pass the time this week. We waited for our families to arrive at the restaurant and when they were all there we walked in and Mike acted surprised. He then said "We actually have a surprise of our own" and told everyone to "read Peyton's shirt." It was amazing everyone was surprised! Mike then proceeded to tell them "Oh and by the way after lunch we are going over to the Fetal Studio to find out the gender". They were even more SHOCKED! Everyone wanted to know how far along I was and how sick I am and things like that. I have been waiting 3 and half months to tell and it was worth the wait! We then headed to the Studio and in a big room they have a projector and an ultra sound machine. The doctor showed us the head and face, then showed us the heart beating. The baby put it's hands up by its face and sucked on its thumb. So cute! The doctor said girls usually have their hands by there face and boys usually have their hands between their legs. Then it was gender time! This stubborn baby stayed profile for a bit. He had me cough a few times and nothing. Eventually after some poking we saw it. BOY! A few more angles he confirmed 100% boy! How wonderful! Houston Michael Hall! The doctor measured him and said you are about 14 weeks and 1 day! Which puts my due date around August. 10th! I'm glad he moved me back up to where I thought I was. He said the baby is a large lemon now. Mike and I are both still in shock. 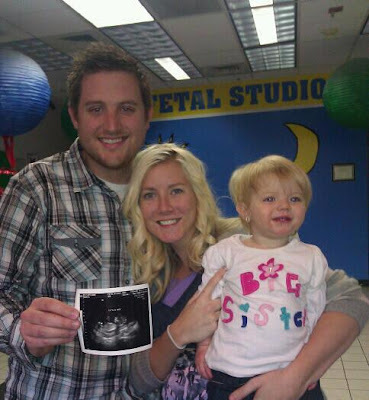 I think we are most shocked it's a boy. I can't wait to get little suits for church and to do his hair in a faux hawk. I'm excited to have legos, trucks and dinosaurs everywhere. I am also happy Peyton will have a protector so close in age. Brothers are the best! Pregnancy is getting more real, I have been sick. I'd say maybe 2 out of 7 days I have an episode. With Peyton it was like 12 times a day. I think that is why it has been hard for me to "feel" pregnant. I am starting to get a bump! 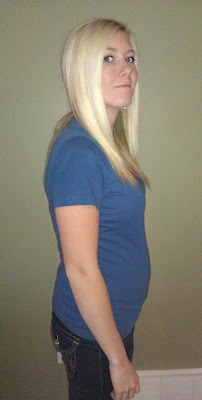 We are in the Second Trimester and that is just crazy to me! Here is the survey I filled out with Peyton. I thought it would be fun to do it again. How far along are you? 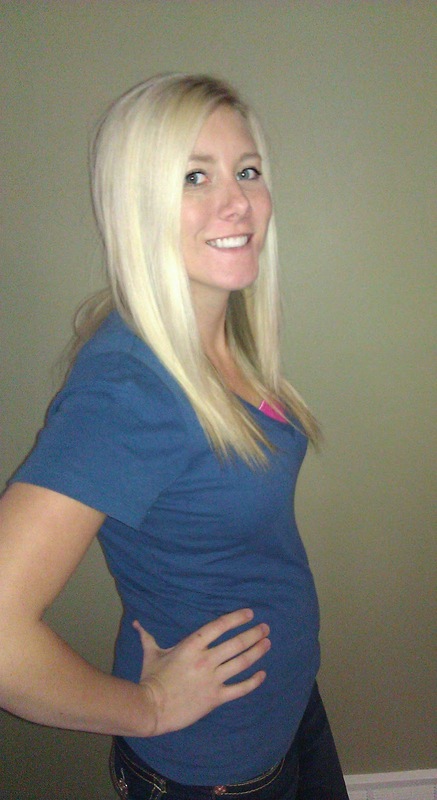 14 weeks and 2 days! Total weight gain/loss: Up 4 four pounds at 12 weeks and down 2 pounds now. Maternity clothes? Only 1 day a week, I can still fit into most of my jeans and all of my shirts. Sleep: It is getting harder to sleep, my back is already hurting. I also wake up twice in the night to tinkle. Best Moment this week: Yesterday, finding out the gender and telling everyone! Movement: Light flutters, but nothing for sure. I think its all in my head. Gender: I thought it was a girl up until yesterday. BOY! What I miss: Not having a mega nose. I hate that I smell every little thing. I also miss running... This summer will be hard when I can't sign up for any races. What I am looking forward to: Holding our sweet little baby boy! Weekly Wisdom: Eat when it is the last thing you want to do. It helps me not vomit, ironically! How fun that you document everything. So exciting! yay!!! congrats you look amazing btw!!! i cant wait to see him. oh my gosh! how crazy! you're pregnant again!? how fun!!!!! Nikki! Congrats! I am so happy for you.. and you look amazing! Yay! congrats you guys! That is so exciting!! He is going to be so cute!